What does the P0343 code mean? The p0343 is being triggered when the engine control unit is getting a faulty signal/high circuit input from the camshaft position sensor. Common causes are a bad camshaft position sensor or bad wirings. 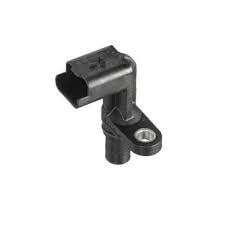 The camshaft position sensor is fitted at one on one of your camshaft. The P0343 is a generic trouble code which applies to all makes and models from around the year 2000. Some engines do have several camshaft position sensors. Because the camshaft needs to have synchronization with the crankshaft sensor in the startup moment, a common symptom is that your engine will be hard to start or not start at all. The 4-stroke crankshaft rotates two turns on one cycle and the camshafts are rotating one turn per cycle. Older cars do usually not have a camshaft sensor and only a crankshaft sensor. This is because older cars do not have to know at which of the turns the crankshaft is at. Each cylinder is firing the ignition and fuel once per each two crankshaft turns and it uses the camshaft sensor to recognize if the cylinder is at the intake or combustion cycle. Older cars without a camshaft sensor are firing the spark plugs two times per turn and therefore, it’s called “Wasted spark”. So instead of firing the ignition coils two times per turn, when it’s only required to do it once per turn, it uses a camshaft sensor. Clean the camshaft position sensor from oil. The most common symptom of the P0343 code is the Engine Light ON and the engine can have long cranking times or it will not start at all. Sometimes you do not expect any symptoms at all for the trouble code P0343. 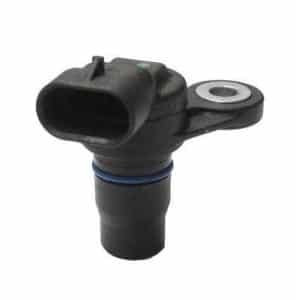 The most common cause of the P0343 code is a faulty camshaft position sensor or faulty wires to the camshaft position sensor. A common misdiagnosing of this trouble code is that it could be a faulty timing belt timing that will cause the p0343 code. This trouble code is telling us that there is a faulty circuit to the camshaft position sensor and should not be mistaken for the other camshaft position sensor trouble codes. This is a guide to how an automotive technician would diagnose this issue. It may require some car electrical skills and the required tools, but you may get some good information about how to do it the right way, without replacing any parts that are not faulty. Always connect a car battery charger when you are doing any work with your car, because low voltage can trigger other trouble codes and even damage control units. Inspect the camshaft position sensor for any external damages and make sure it is not fouled by oil from an oil leak. Inspect the connector and check for any corrosion/bad connection. Remove the connector from the engine control unit and find the pins to the camshaft position. Do the same procedure with the camshaft position sensor connector plugged in. If you get no connection between these pins there might be an open circuit in the wirings. Check for any connection between the wires. If there is a connection between the wires, the wires are shorted. Erase the code and make a test drive to verify that the problem is gone. Check your trouble code memory after some test drives to be sure that the problem is gone. The code can still be stored without the engine light to be ON. If you do not find any damages to the wires or camshaft position sensor, it may be a faulty engine control unit. But these cases are really rare and you should do a correct troubleshooting before replacing your engine control unit, as they are quite expensive. Read the Trouble code memory: FOXWELL NT301 Scan Tool. For advanced troubleshooting, you may need a more advanced code reader. If you have any other questions about the P0343 code, comment down below and I will answer you as fast as possible. If you have any other car questions you are welcome to ask us at our homepage. I came across a 2010 VW Jetta 2.5 with a P0343 and all I get out of the 3 wire harness plug (using a power probe) is, 1) ground, 2) 4.8 volts and 3) nothing. This is unplugged by the way. Plugged up, it shows basically the same except there’s activity at the terminal (3) that had nothing at first, which would lead me to believe there’s some kind of activity going on there. Charging system tests okay, I cleaned the throttle body assembly, I got 60 psi fuel pressure while running, This code is now “permanent” by the way. This vehicle will not rev over 3k also. I tried an aftermarket cam sensor, used VW brand cam sensors (2) to no avail. Can an “off” timing belt cause all of this? This is a neighbor’s car and I was just trying to help out. I’m no better than somebody that knows nothing when it comes to European cars. The P0343 code is a bit tricky yes, the high input can in rare cases, be caused by a faulty timing. But for most of the times, it’s a faulty circuit either caused by a faulty camshaft sensor, a wiring issue or the engine control unit. You can also get problems if another sensor is faulty and making a short in the circuit. But in this case, if you have checked the wirings and replaced the sensor to an OEM sensor, and checked the crankshaft sensor I would take a look at the timing. Thanks for your advice. Here is my issue. 2002 BMW 540i (M62TU engine). I am not a mechanic but an enthusiast and do all the work on my cars. Started with a p0011 code, opened up the engine and replaced the timing guides, timing chains, rebuilt VANOS gears. Put it all together and ran great for a week, then bad. Took it apart again and found the bank 1 oil guide seal (intake cam) snapped and were causing oil pressure issues in the VANOS. Replaced bank 1 intake cam (checked by pro machine shop and was good cam), replaced VANOS gear with another rebuilt one, replaced timing trigger wheel. Car runs good, but now it has a constant P0343. Opened it up a third time and rechecked timing and it was perfect. Still getting P0343. Pin 2 has 12v, both sides, I know you say it should be 5V but both mine say 12 v. , is BMW different? Checked pins at DME and visually look good. Measure frequencies at pin 2 and 3 with the car running and both sides were at approximately 800 Hz with the car at 500 rpm, with the numbers varying from 600-1000Hz, both sides. Delete code and on the first start there is no code, no matter how long I drive it. At the second start the code appears. First, you should replace both bolts to the camshaft sensors to make sure they are not magnetic. Make sure the harness is ok. On the M62TU engine, there is a common problem with the thermostat housing heater is going bad and pushing coolant inside of the wires into the engine control unit. Check the engine control unit connector and make sure that there is no corrosion or coolant inside the connector and the control unit. Then you have to measure the signals from the camshaft sensors both directly on them, and at the engine control unit connector, to see if you can see any differences in the signal.